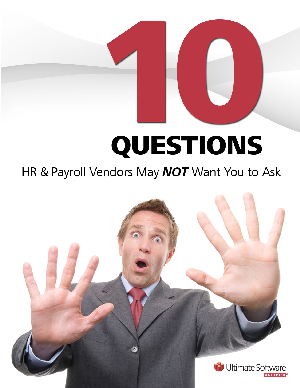 Read the complimentary white paper, 10 Questions HR & Payroll Vendors May NOT Want You to Ask. Some HR/payroll vendors — even your current provider — may try to sidestep several key questions. What are they and why are they so important? Use this must-have whitepaper as a checklist of the most relevant questions to ask HR or payroll vendors to be sure you are getting the most out of your human capital management solution. Whether you're looking for a new HR/payroll vendor now or in the future — or if you just want to evaluate your current vendor — you'll want this paper.